Heated Seats, Rear View Camera, Heated Steering Wheel, Wireless Charging, Bluetooth! Hurry in, Kia's Conquer Winter event is now on! 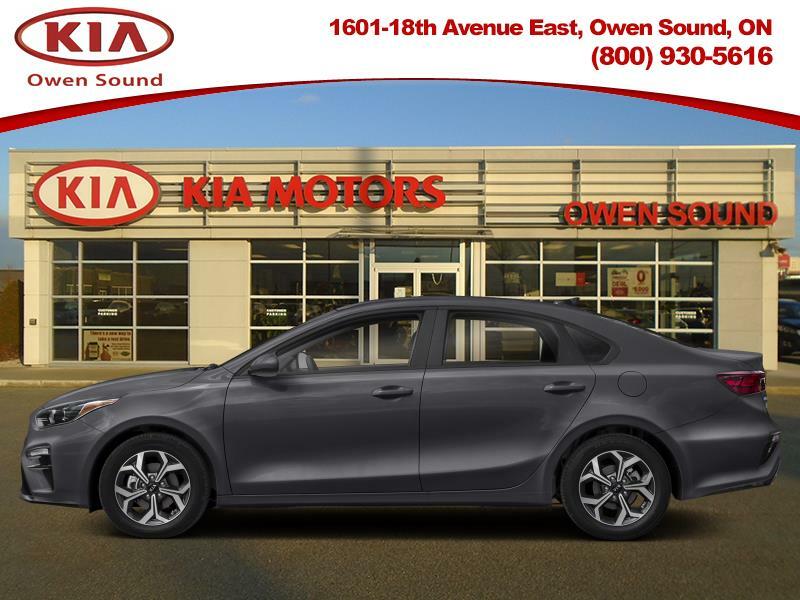 This 2019 Kia Forte balances classic proportions with upmarket detailing, further complemented with admirable on road capabilities and stunning good looks. Very reminiscent of the flagship Stigner, this Kia Forte has the good looks to match its outstanding performance capabilities. With a spacious interior seldom found in a compact sedan, this Forte offers the practicality for a vibrant and active family. Further complementing the quality of this vehicle is the excellent fit and finish, both inside and out, allowing for a solid feeling regardless of the road surface or condition. This gravity grey* sedan has an automatic transmission and is powered by a 147HP 2.0L 4 Cylinder Engine. Our Forte's trim level is EX IVT. This Kia Forte EX comes standard with a very well appointed interior featuring sporty a power sunroof, a powerful 6 speaker stereo with an 8 inch display, Apple and Android smartphone connectivity, wireless device charging, a heated leather and metal look steering wheel, heated front bucket seats, manual air conditioning, cruise control, front and rear center armrests as well as power front and rear windows. The stylish exterior of this Forte has been fitted with the most modern options such as body colored heated side mirrors with turn signals, perimeter and approach lights, fully automatic projector beam LED headlamps, LED brake lights, a sporty chrome tail pipe finisher, blind spot detection, autonomous emergency braking, rear cross traffic alert, a rear view camera and much more. This vehicle has been upgraded with the following features: Heated Seats, Rear View Camera, Heated Steering Wheel, Wireless Charging, Bluetooth, Blind Spot Detection, Aluminum Wheels. Total rebate of $1000 is reflected in the price. Credit includes $500 Non-Stackable Trading Dollars and is available in lieu of subvented financing rates. Includes $500 Conquer Winter Bonus Cash.Ask us about the 1% Loyalty Rate Reduction for current Kia owners. Incentives expire 2019-02-28. See dealer for details. Higher Price+ $2203 ABOVE avg.